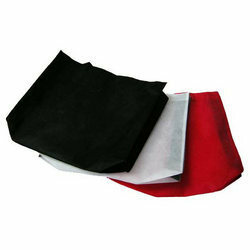 We are engaged in manufacturing and exporting a quality range of Non Woven Bags. In this, we offer Non Woven Promotional Bags, Promotional Non-Woven Bags, PP Non-Woven Promotional Bags, Non Woven Shopping Bags and Eco Non Woven Shopping Bags. These bags are available in variety of colours, widths, designs and shades and can be bought at industry leading prices from us. We manufacture and export a wide range of PP Non-Woven Wine Bags. These bags are available in diverse colours, patterns and styles and are ideally used for packaging wine bottle. Made of quality jute, these bags are offered in specifications as per the requirements of the customers and can be bought at market leading prices from us. We are a well known manufacturers and exporters of a quality range of PP Non-Woven Shopping Bags. These bags are available in various sizes, shapes and colour combination and are known for unique designs & beautiful patterns. Moreover, these bags are very useful in meeting the shopping needs of the customers.